* All services listed are available at both locations. Please refer to Body Treatments for additional spa services. Massages feel wonderful, but are also beneficial to your health. They reduce heart rate and blood pressure while increasing circulation and lymph flow, relax muscle tissue, improve range of motion, and increase serotonin release. This service can have a profound effect on your physical, emotional and mental state. Our Licensed Massage Therapists will customize your therapeutic session based on your goals and needs. Reduce stress and share your massage experience in a serene, private space with a loved one. This is the perfect way to celebrate any special occasion, or to unwind during a busy week! ONLY after the 1st Trimester; doctor’s note recommended. Our Licensed Massage Therapists will focus on any areas of joint discomfort and muscular tension, while reducing anxiety and stress to improve mood regulation. Potential benefits include reduced edema and back & hip pain, increased oxygenation to soft tissue, fewer headaches, and better sleep. Whether you’ve received a stone massage many times, or are curious about trying a session, this is an excellent way to address chronic pain. Stones are placed on acupressure points along the body, and also used as tools throughout the service. The heat from the stones is soothing and therapeutic, allowing the therapists’ massage techniques to work into deeper layers of muscle tissue. Choose essential oils to incorporate into your session for added therapeutic benefit and a lovely scent throughout any massage. My heavenly retreat for relaxation! Decor is simple, beautiful, and comfortable. The atmosphere is tranquil. You’re given a beverage of choice while you wait for your masseuse or esthetician in a dimly lit waiting area with soft, relaxing music. Between my mimosa and the surroundings, it’s inevitable that my body beings to become less tense at this point. If you’re going to get a massage during your visit, and I always do, you MUST go all out with the 80 minute massage. Anything less and you’re shorting body of complete comfort and revitalization! What amazed me the most is how much my masseuse, Ashley (“Ash”) C., could verbalize my habits and lifestyle through working on my muscles. Yes, I do look down and pick up a lot (small children). Yes, I do sleep on my stomach and in weird positions. Yes, I do clench and grind my teeth. She’s that good! Best of all, she gave me self-help tips for each of these unhealthy habits. She didn’t just pat me down and send me out the door with a request to come back ASAP (although I clearly will). She was truly interested in helping me take care of my body! When your treatment is complete, you’re escorted to another area of the spa where you can shower, change, and take care of your needs before stepping back into the real world. They have hair dryers, complimentary combs, beauty products and other assorted toiletries. I was impressed. I encourage everyone to come here and treat yourself to any one of their services! You will not regret it. I just wanted you to know that my husband had our spa treatments yesterday and were very pleased and impressed with them all. Having never had a facial before, we were pleasantly surprised and loved how smooth our skin felt. The couples massage was fabulous and ending with the pedicures with the delightful Doris was a great treat! When we are in New Orleans again, we will return. Thank you so much for your help in making our anniversary trip so special. 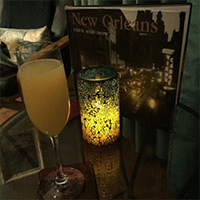 My husband and I made a weekend getaway to NOLA two weeks ago. When we arrived on Friday, we walked into the spa to see if they had some time for a couples massage on Saturday. We were greeted so warmly. The young lady checked the schedule and worked us in on Saturday afternoon. When we arrived on Saturday, we were welcomed with mimosas. We were lead to the relaxation room and waited for our session. Everything was so clean and modern. We were scheduled for an 80 minute session. It was fantastic. We have a massage membership at home and get at least one massage per month. The massage I had at Spa Atlantis French Quarter was the best massage I have ever had!! I highly recommend Andre. We will definitely be back on our next trip to New Orleans.